Visit eFaucets, online at eFaucets.com, for the latest products in kitchen and bath. eFaucets carries a huge selection of faucets, sinks, fixtures, lighting, tub and shower accessories, and garbage disposers. eFaucets offers the lowest prices, guaranteed, on brands like American Standard, Kohler, ShowHouse, Riobel, and more. At eFaucets, find sinks and faucets galore, and deep discounts on items to improve your home. Visit RetailSteal.com for eFaucets coupons, eFaucets discounts, and eFaucets promotions. eFaucets offers free ground shipping on orders over $99. eFaucets ships to the 48 contiguous United States, Alaska Hawaii, and the US Virgin Islands. eFaucets allows 30 days returns and 60 day exchanges. Check site for full details, exclusions may apply. Act now and take advantage of a 10% discount on select kitchen faucets with this coupon code from eFaucets. See site for details. Use this coupon code on eFaucets to save 10% on your entire order. Shop at eFaucets and save 10% on select toilets. Spend $5000 or more on eFaucets.com and you can save 6% with this coupon code. Save 5% with any order over $2,000 when shopping online at eFaucets.com. Click to shop. Shop at eFaucets.com and when you spend $1000+ they'll treat you to a 5% discount with this coupon code. Use coupon code to get $300 off your $5,000 Kitchen remodel order from eFaucets.com. Use coupon code to get 2% off your order over $500 from eFaucets.com. 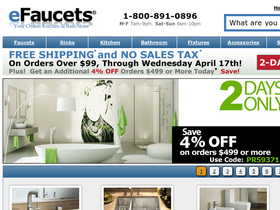 Save up to 40% on brand names for your kitchen and bath at eFaucets.com. Click link to shop. Save $10 on any order plus get free shipping when spending over $199 at eFaucets.com. Click to save. Pay no sales tax on any order at eFaucets. Click link to save. Enjoy free ground shipping on your over $99 from eFaucets.com. AbesOfMaine.com is now offering free shipping on brand name appliances. Click link to shop. Save up to 60% on Clearance and Closeout items from AbesofMaine.com. Click link to shop. Check out the daily deals for Abe's of Maine, online at AbesofMaine.com and save up to 55%. Act now and take advantage of a 7% discount on your order with this coupon code from Air-N-Water.com. Enjoy free ground shipping on select Air & Water products. Click link to shop. Shop online at Air-n-Water.com for savings of up to 75% on last chance items. Click link to shop. Subscribe to the newsletter online at BloomingBulb.com and get an automatic 10% off your first order. Click link to get started. Enjoy free shipping on most items from Blooming Bulb. Some exclusions may apply, so click link and visit website for details. Save up to 60% online at Boscov's for special weekly web prices. Click link to get started. Find great deals and hot buys at Boscov's Outlet Center. Click link to save up to 80%!